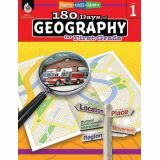 180 Days of Geography for First Grade provides teachers and parents with 180 days of daily practice to build students' geographical knowledge and skills. Through these weekly units, grade 1 students will improve their geographic background knowledge, critical thinking and reasoning skills, map and spatial skills, and answer photo- and text-dependent questions. This essential social studies resource provides teachers with the tools they need to provide detailed instruction on map skills, key geographical concepts, and the five themes of geography: location, place, human environment/interaction, movement, and region. 180 Days of Geography for Second Grade provides teachers and parents with 180 days of daily practice to build students' geographical knowledge and skills. Through these weekly units, grade 2 students will improve their geographic background knowledge, critical thinking and reasoning skills, map and spatial skills, and answer photo- and text-dependent questions. This essential social studies resource provides teachers with the tools they need to provide detailed instruction on map skills, key geographical concepts, and the five themes of geography: location, place, human environment/interaction, movement, and region. With the world becoming more connected, learning about different places through a geographic lens will equip 21st century students with the skills they need to betterunderstand diverse cultures and regions in an increasingly interdependent world. An introductory two-week unit focuses on teaching the map skills that students will use throughout the rest of the book. Subsequent units will introduce students to a new place or a type of map, and will explore the relationship between geography and culture. This book helps teachers meet National Geography Standards and state standards in their classrooms. 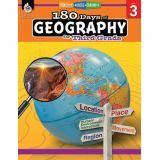 180 Days of Geography for Third Grade provides teachers and parents with 180 days of daily practice to build students' geographical knowledge and skills. Through these weekly units, grade 3 students will improve their geographic background knowledge, critical thinking and reasoning skills, map and spatial skills, and answer photo- and text-dependent questions. This essential social studies resource provides teachers with the tools they need to provide detailed instruction on map skills, key geographical concepts, and the five themes of geography: location, place, human environment/interaction, movement, and region. 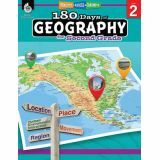 180 Days of Geography for Fifth Grade provides teachers and parents with 180 days of daily practice to build students' geographical knowledge and skills. Through these weekly units, grade 5 students will improve their geographic background knowledge, critical thinking and reasoning skills, map and spatial skills, and answer photo- and text-dependent questions. This essential social studies resource provides teachers with the tools they need to provide detailed instruction on map skills, key geographical concepts, and the five themes of geography: location, place, human environment/interaction, movement, and region. 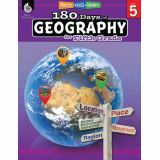 180 Days of Geography for Sixth Grade provides teachers and parents with 180 days of daily practice to build students' geographical knowledge and skills. Through these weekly units, grade 6 students will improve their geographic background knowledge, critical thinking and reasoning skills, map and spatial skills, and answer photo- and text-dependent questions. This essential social studies resource provides teachers with the tools they need to provide detailed instruction on map skills, key geographical concepts, and the five themes of geography: location, place, human environment/interaction, movement, and region. 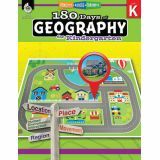 80 Days of Geography for Kindergarten provides teachers and parents with 180 days of daily practice to build students' geographical knowledge and skills. Through these weekly units, Grade K students will improve their geographic background knowledge, critical thinking and reasoning skills, map and spatial skills, and answer photo- and text-dependent questions. This essential social studies resource provides teachers with the tools they need to provide detailed instruction on map skills, key geographical concepts, and the five themes of geography: location, place, human environment/interaction, movement, and region. From KWLs to “foldables” and more, the Alabama Interactive Notebook: A Hands-On Approach to Learning About Our State! resource includes activities that will have students exploring their state's history, geography, people, government, economics, and symbols in a whole new way! 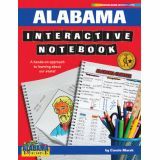 A true-time saver, the Alabama Interactive Notebook: A Hands-On Approach to Learning About Our State! includes ready-to-use pages and instructions that make state-studies fun and successful for the whole class. The Alabama Interactive Notebook: A Hands-On Approach to Learning About Our State! is more than just a notebook for taking notes—it's a way of collecting and thinking about information. The Alabama Interactive Notebook: A Hands-On Approach to Learning About Our State! helps students become creative, independent, and reflective thinkers, readers, and writers. Students learn to express their own ideas and apply skills learned in class. The Alabama Interactive Notebook: A Hands-On Approach to Learning About Our State! gives teachers ready-to-use pages, templates, instructions, writing prompts, and more, making it easy to start using their interactive notebooks today!WHY USE INTERACTIVE NOTEBOOKS? From KWLs to “foldables” and more, the Alaska Interactive Notebook: A Hands-On Approach to Learning About Our State! resource includes activities that will have students exploring their state's history, geography, people, government, economics, and symbols in a whole new way! A true-time saver, the Alaska Interactive Notebook: A Hands-On Approach to Learning About Our State! includes ready-to-use pages and instructions that make state-studies fun and successful for the whole class. The Alaska Interactive Notebook: A Hands-On Approach to Learning About Our State! is more than just a notebook for taking notes—it's a way of collecting and thinking about information. The Alaska Interactive Notebook: A Hands-On Approach to Learning About Our State! helps students become creative, independent, and reflective thinkers, readers, and writers. Students learn to express their own ideas and apply skills learned in class. The Alaska Interactive Notebook: A Hands-On Approach to Learning About Our State! gives teachers ready-to-use pages, templates, instructions, writing prompts, and more, making it easy to start using their interactive notebooks today! This book provides an in-depth look at our nations history and one of the most significant judicial turning points in our country. The Brown decision initiated educational and social reform throughout the United States. This book describes fascinating facts and fun activities your students will love! The American Milestone series are a favorite among teachers nationwide! Each book includes ideas for lesson plans, hands-on activities, biographies, fascinating facts and stories. 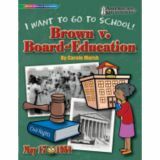 Your students will be amazed as they study Brown v. Board of Education because it is not simply about children and education but it improved human rights struggles across the country and around the world. The American Milestone series meets national and social studies standards. This 28-page comprehensive book is reproducible and educational. 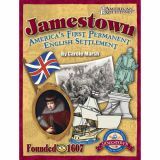 Jamestown, America's first permanent English settlement, was established 400 years ago. Neither the Old World, nor the New World (America!) was ever the same. This book describes fascinating facts and fun activities your students will love! The American Milestone series are a favorite among teachers nationwide! This book includes ideas for lesson plans, hands-on activities, biographies, fascinating facts and stories. Your students will be amazed as they study Jamestown. The American Milestone series meets national and social studies standards. This 32-page book is reproducible and educational. Once upon a time, Thomas Jefferson had an idea: Someone should go and search for the other end of America! Surely it would just be a hike across the plains to the sea? And who would go? 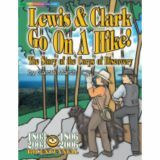 How about Lewis and Clark? "Take a hike, boys!" Tom said, and they did! And so began the most remarkable trek in American history! This book describes fascinating facts and fun activities your students will love! The American Milestone series are a favorite among teachers nationwide! This book includes ideas for lesson plans, hands-on activities, biographies, fascinating facts and stories. Your students will be amazed as they study the life of Abraham Lincoln. The American Milestone series meets national and social studies standards. This 32-page book is reproducible and educational.